Posted on Thu, May 30, 2013 : 11 a.m. The schools forming Michigan’s University Research Corridor announced in a study released today that approximately 19 percent of 40,000 surveyed alumni have started a company and more than 50 percent of those businesses are in Michigan. 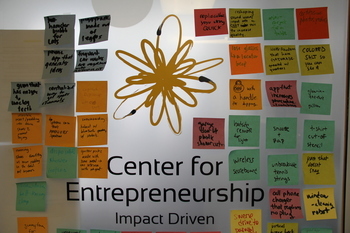 The Center for Entrepreneurship at the University of Michigan provides resources for students interested in starting their own companies. “The URC is committed to supplying the tools that can lead to new companies and more jobs,” executive director Jeff Mason said in a statement. At the University of Michigan, the tools available to entrepreneurial faculty and students have grown over the years and now form an ecosystem that can support nearly any startup company. The Center for Entrepreneurship in the College of Engineering, the Zell Lurie Institute for Entrepreneurial studies in the Ross School of Business, the TechArb student startup incubator, the Office of Technology Transfer, the Michigan I-Corp program, the new masters in entrepreneurship program and the MPowered student group are just the tip of the iceberg. Local U-M alumni entrepreneurs also regularly lecture at the school and serve as mentors for students starting their own companies. According to the study, alumni from the 1960s and 70s had one of the highest rates of entrepreneurship. Perhaps inspired by these returning mentors and the schools' emphasis on entrepreneurial activity, the study also found that recent graduates are starting businesses at a younger age than ever before. Read the full story from MLive. Thu, May 30, 2013 : 9:48 p.m.
LOL! when i graduated in 2009 from one of said premier research universities, they were laying this entrepreneurship stuff on thick. why not? nobody was hiring. at that time, i was fortunate to already have a job at the U (still do, still fortunate) and was taking the last few courses for my BSE as a part time student while i was working full time. i recall once pointing out in class that the failure rate of start-ups is well in excess of 95% and many of my colleagues had student loans to pay. the response? well, if it doesn't work out, you're young enough to go back and live in your parent's basement for a while! i guess there's a lesson in there somewhere about being &quot;free to try, free to fail&quot; but it felt to me at the time like very weak sauce indeed. and so were the career prospects in one of the nation's finest undergraduate engineering programs in 2009. thank god the economy is starting to turn around a little bit from those dark times. here's hoping there's a bit more in the way of stable career prospects for young graduates to choose from these days. and to the crazy few who persist with the start-ups, good luck! i thank my lucky stars every day that i managed to find my place in this nutty economy we now have. Thu, May 30, 2013 : 4:32 p.m.